The recently renovated Akrotiri Hotel with magnificent views overlooking Paroikia bay is an ideal choice of lodging for visitors seeking peaceful stylish accommodation, friendly ambience and helpful service on the island of Paros. Built in traditional Cycladic architectural style, Akrotiri Hotel is ideally situated 2km from the port and 350m from the sea, offering a combination of countryside relaxation and easy access to local bars and restaurants and the famous Krios beach. The swimming pool and the lobby-balcony are surrounded by colourful gardens and offer a panoramic view where guests can relax enjoying a drink or a snack from the hotel bar. 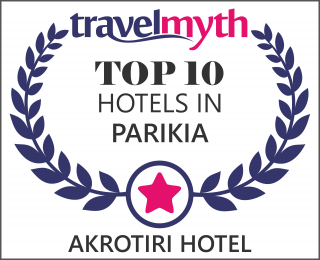 Akrotiri Hotel offers a variety of Double rooms, Twin rooms, Triple rooms, Quadruple rooms and Family rooms. All rooms have a private balcony with sea view, TV, air conditioning, hairdryer, refrigerator, safety deposit box and private bathroom.